16 yrs old Lakshya Sen lifted his first International Series title outside India ... Overall this was his 2nd International Series title as before this he won Indian International Series title in late 2016 ... Here in Bulgaria, he defeated British top-seed in the first round and Croatian 2nd seed in the final for comeback win ... I am having big hopes from this young lad. Lakshya Sen was seeded #2 but unfortunately lost in the quarters. World Junior Championships He may be the first marquee product Prakash produced. But, he has to improve and be more consistent. Hope the hype does not get to him. Lakshya has entered into top-100 ranking for the first time ... He posted a nice message on Twitter. Lakshya Sen wrote: So excited to break into the top 100 for the first time. I would not be here if not for all the support I have received along the way. In particular I would like to thank my father and Prakash Padukone sir and all my coaches/ trainers at PPBA who have mentored me at every step. Lakshya Sen lifted junior Asian Championship beating current junior WR #1 Thai Kunlavut Vitidsarn in straight games ... Before that in the quarters, he defeated JR WR #2 Chinese player, Shifeng Li in straight games and in the semis defeated #4 seeds local player, Ikhsan Leonardo Imanuel Rumbay convincingly. very good and convincing tournament from Lakshya sen, especially the final against the reigning world junior champion. 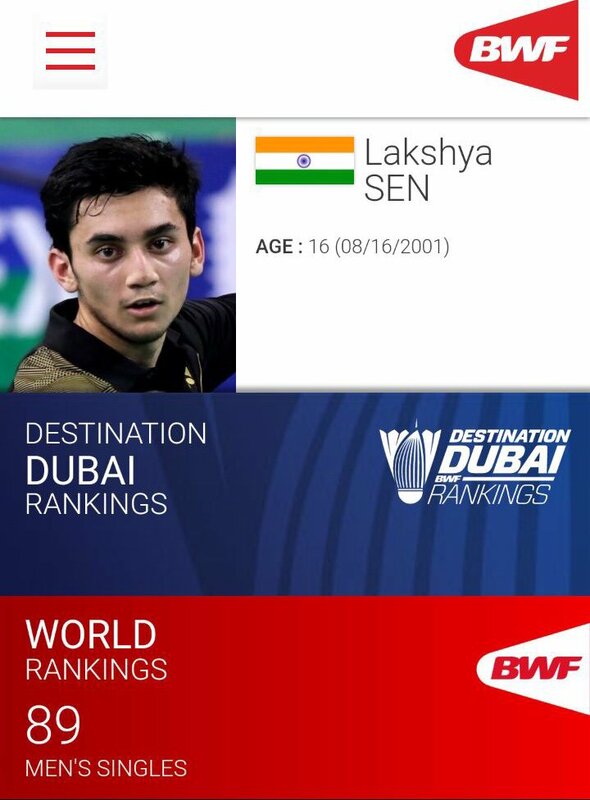 Lakshya Sen lost in the SF of the world junior championships currently underway in Markham, Canada. He lost to current junior world #1 Kunlavut Vitidsarn of Thailand in 3 close games - 22-20, 16-21, 13-21. Somewhat disappointing as Lakshay had beaten the same player in the finals of Asian juniors in July. If Laskshya had won, he would have met the Japanese Kodai whom he had beaten in the youth olympics semi finals. Kodai in turn beat the Chinese youth olympic gold medalist in the other semi final in 3 close games. So, looks like Lakshya is is among these 4 Asian players who are dominant at the junior stage as of now. Next 2-3 years would be crucial to see who among these develop into a world class senior player. It appears that they are all about the same level at this age. Just looked at the boys' champions from 2008 to 2017. Only ones to get to the very top were Axelsen and Momota. Tian Houwei at least got to the 10 for a while. Rest did nothing. Chen Long was the winner in 2007. Pretty clear that success amongst the juniors in the girls leads to high level success. Indian medalists in the boys in this period include HS Prannoy, Sai Praneeth, Siril Verma none of whom have really taken the senior circuit by storm. I think it is fair to keep expectations in check around Lakshya. What is disappointing is the lack of success in the girls after Saina and Sindhu. Lakshya Sen lifted the Tata Open India International Challenge 2018 beating World Jr. Champion Kunlavut Vitidsarn 21-15 21-10 in the final ... Lakshya had lost to Kunlavut in the semis of World Jr. Championship last month. Yes, that was a very good win by Lakshya in the final. How good is PPBA? Who else besides Lakshya (that is world class) trains there? I am not sure how involved Prakash is in the day to day operations. I see that Vimal Kumar is the chief coach but the rest of the coaches don't appear to be that stellar. I only recognize Sayali Gokhale. I know Saina went to Vimal Kumar for sometime. But has he done anything with anyone? There was some improvement in Saina's game when she was with Vimal Kumar for a year or so but it stagnated again as although she was getting a lot more attention at PPBA she was not getting the kind of competition she was getting at Gopichand Academy. But, yes I have not seen anyone other than Lakshya doing well from PPBA. If this continues, he may also eventually have shift to Gopi academy to get some good competition in training. Lakshya is having a very good run at China masters. Those wins in the first round and quarter finals are quite good. The Singaporean Loh won the Thailand master title in January and has registered wins over Lin Dan, Leverdez, Jorgensen, Kashyap etc this year. To beat him in straight sets was commendable as also a win over a 42nd ranked Chinese on his home turf in QF. He plays another Chinese in the SF. Lakshya lost in the semi final against the Chinese. Still a good run at senior level for Lakshya.